This software will be delivered electronically. Usage is monitored from a school server, and any computer on the network can access the software, up to the number of licenses purchased. Network connection is required, except that a license may be "checked out" and used outside the network for up to 30 days. TI-SmartView for TI-84 emulator software for Windows and Macintosh is an easy-to-use, effective demonstration tool for leading the classroom exploration of math and science concepts. Based on the functionality of the popular TI-84 Plus family of graphing calculators (and compatible with the TI-83 Plus family), the TI-SmartView complements classroom calculator use by projecting an interactive representation of the calculator, plus offers many unique instructional capabilities. 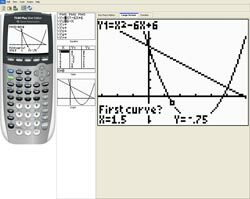 Highly interactive computer emulation of TI-84 Plus family graphing calculators, from the TI-83 through the new TI-84 Plus-C color calculator.